Fans certainly got their money’s worth that’s for sure. Yes, Smashing Pumpkins, the reunited Smashing Pumpkins, (minus one) brought an extensive show to the Moda Center on Saturday in Portland with a 31 song set list that started at about 8:15 p.m. and finished around 11:30 p.m. Lots of hits in this set along with deep album cuts and a few covers plus a new song highlighted on The Shiny and Oh So Bright tour. The band followed with the great rock song “Siva” as Corgan and guitarist Jeff Schroeder traded off on two solid guitar solos then the band turned it down a notch for “Rhinoceros” off their debut album Gish . The only real lowlight of the evening came from the David Bowie cover “Space Oddity” which was not only odd as Corgan was decked out in a hooded cloak but the song just doesn’t mesh with his vocals or the Smashing Pumpkins style for that matter. It popped the energy balloon filled by the quick start. Seriously, juts leave it off the setlist or at least make it your own with some Pumpkin flavor. Unfortunately, “Drown” suffered from this lead-in but the crowd and band were fully in tune with “Zero” the first of seven off the multi-platinum double album Mellon Collie And The Infinite Sadness from 1995 and the evening continued to progress nicely with “Everlasting Gaze” the opening cut off 2000’s Machina / The Machine Of God and then the great “Stand Inside Your Love” off the same album that marked the end of the band’s original line-up of Corgan, Iha, drummer Jimmy Chamberlin and bassist D’arcy Wretzky. Ten songs in and Iha welcomed the crowd which mostly filled the arena though about half of the upper 300 level was curtained off. He introduced “Thirty-Three” and the evening continued with the outstanding “Eye” the band’s contribution to the soundtrack for the movie “Lost Highway.” Pumpkins tapped back into Siamese Dream for the slower paced “Soma” which picks up nicely midway through and featured an outstanding Corgan guitar solo who then stepped aside as Iha sang “Blew Away” the first of two off Pisces Iscariot . imagery no doubt, and perhaps a revealing moment into some of Corgan’s internal pain. The middle portion of the setlist focused on some heavier, deep album cuts that mostly out-shined the studio versions which prevented any lag into the show. “Mayonaise” was a hit with the crowd and “Porcelina of the Vast Oceans” timed in at about 13 minutes thanks to one of the longest and fully structured guitar solos you’ll ever hear, another Corgan classic. A batch of their radio staples began the final third part of the night with the Fleetwood Mac cover “Landslide” a hit single off Pisces Iscariot, a compilation and B-sides album from 1994. The popular “Tonight, Tonight” followed and then a really well-done cover of Led Zeppelin’s “Stairway to Heaven” with Corgan playing piano in place of those famous opening guitar chords. 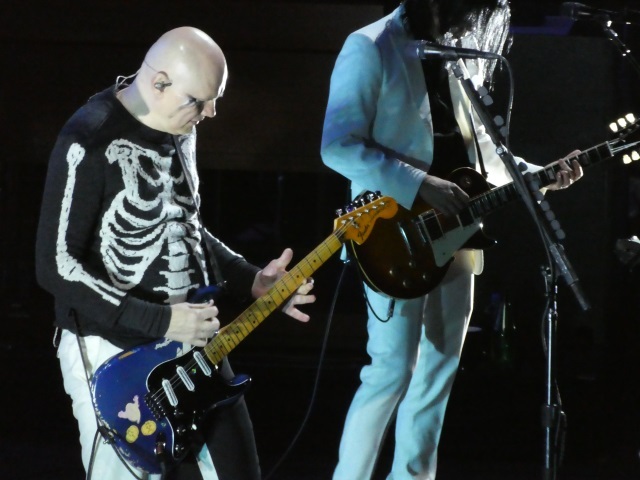 Smashing Pumpkins, or in many respects perhaps singer and founder Billy Corgan (it is his band), have not exactly been absent the last 20 years when the band last enjoyed an extensive heyday. Corgan has kept the Pumpkins afloat releasing a handful of albums since the Core 4 break-up in 2000 but now the band moves on mostly intact (minus one) with a future Corgan and company hope proves shiny and oh so bright. 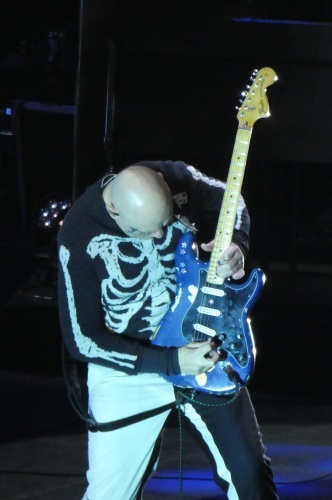 Wretzky, who admitted to having an injured shoulder, did not join the reunion tour and depending on what outlet you believe it sounds more like irreconcilable differences as Iha and Chamberlain, have rejoined and working on new Smashing Pumpkins music, though Chamberlain was brought back into the fold three years ago. Jack Bates (son of Peter Hook off New Order fame) took up the bass parts in place of Wretzky. The band focused entirely on their first five albums, relying on heavy cuts from their two most popular albums but even stretched back nearly 30 years to the Gish as nothing off the last four albums, helmed by Corgan without his founding bandmates, was played. 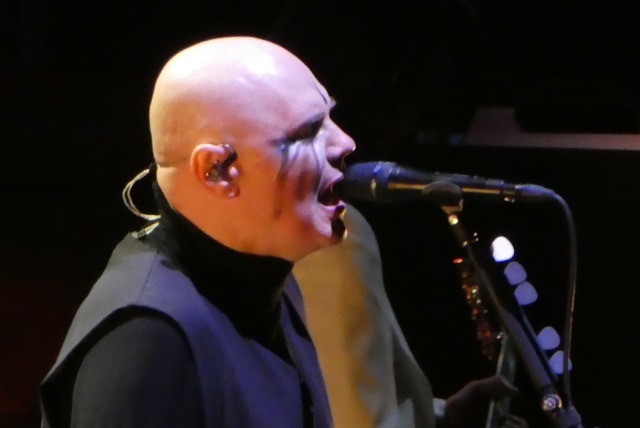 Smashing Pumpkins encored with the fantastic new song “Solara ” and if this helps show where the band plans to embark on the future then the coming years indeed look shiny and oh so bright. They finally crossing the finish line with the Betty Noyes cover “Baby Mine.” Huh? OK, certainly Corgan has an eccentric personality but who is Betty Noyes and why would this rock band cover her song AND make it the final song on a 31 song setlist? Walk-out music? Cause that’s what a lot of people did. Sure it sounded nice but enough was enough. Time to go home. The final song is from Dumbo. I read that. Do you know the history? Thanks. Man,you got your money’s worth….